As we are aware that Electricity Tariff have been revised W.E.F. April 01, 2018. Due to that there's some change in applicable rates for Group Housing Societies having 11 kV connection and by availing various schemes of Delhi Govt; Group Housing Societies of Dwarka can benefit a lot. We have tried to briefly pen down few pointers which can be discussed, analyzed and if found feasible can be implemented. 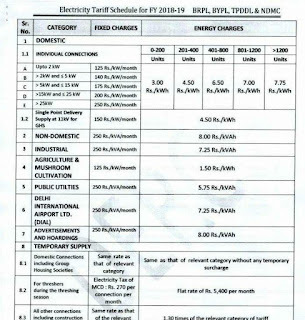 As per the DERC's Electricity Tariff Schedule for FY 2018-19 the Single Point Delivery - Supply at 11kV for GHS (Group Housing Societies) the unit rates have revised from April 01, 2018. Earlier per unit consumption charges were Rs. 6/kWh; which have now been reduced by 25% to Rs. 4.5/kWh. 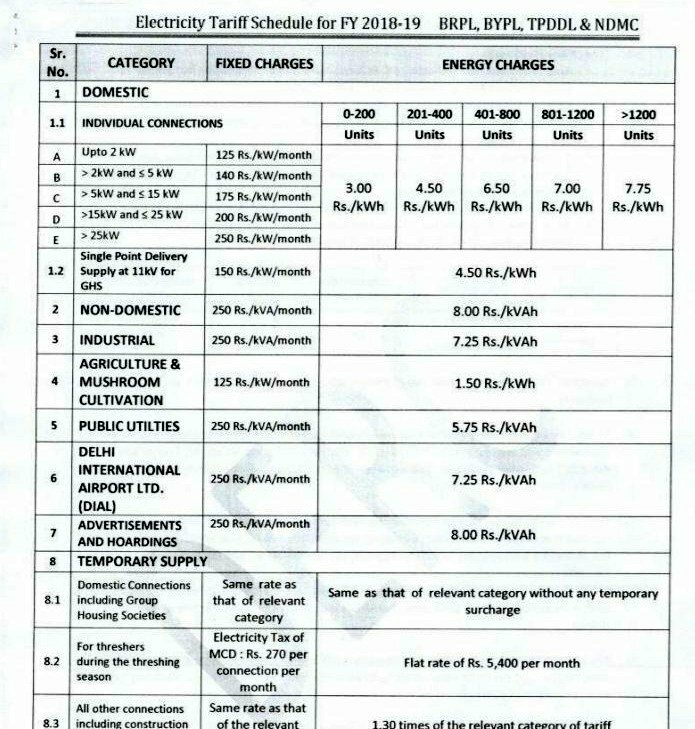 Tariff order issued by DERC for 2017 - 18 & 2018 - 19 is also attached for quick reference. The fixed charges as per sanctioned load has been increased from Rs. 40 / kW / month to Rs. 150 / kW / month. This may get negated due to some extent due to reduction in per unit consumption charge and my lowering sanctioned load if it's very high. 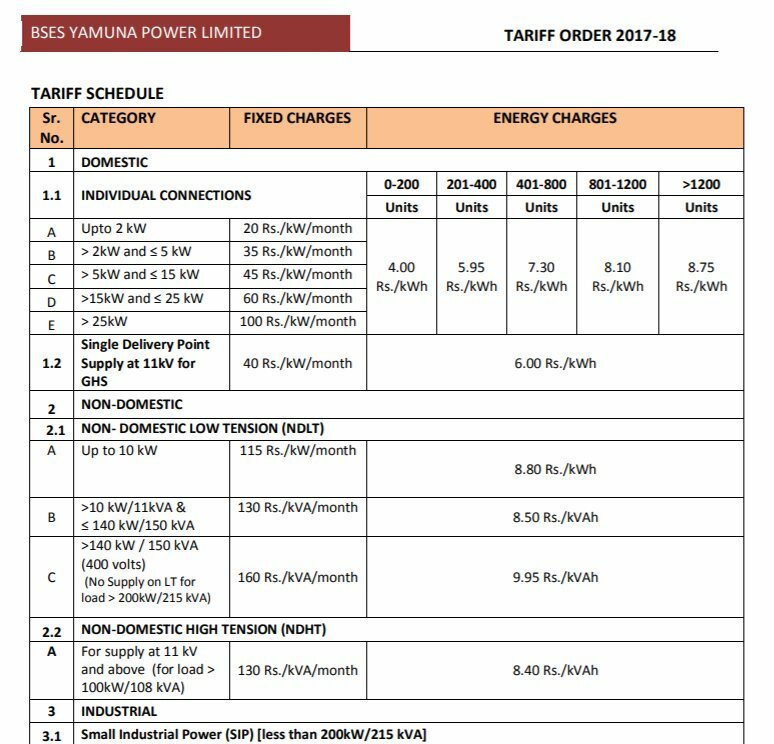 I have been informed that in the month of Feb 2018; BSES bill carried a letter regarding comparison between Sanctioned Load viz a viz Maximum Demand Indicator. As per that it has been observed that in most of Group Housing Societies (GHS) the Sanctioned Load (SL) is way above MDI. BSES has advised all GHS to provide it's consent for reduction in sanctioned load; in case there's huge variation between MDI / SL. So, there's a possibility that fixed santioned load of of socities may come down. Thus, leading to reduction in total fixed charges payable (i.e. Sanctioned load x Fixed Charges). 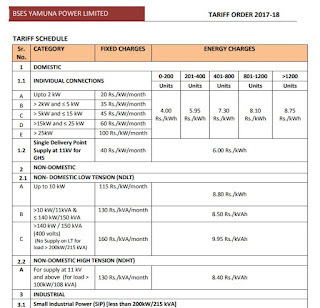 Delhi Govt's subsidy @ 50% electricity rate to all domestic consumers consuming upto 400 units / month is also available to domestic consumers be it Multi Point connection or Single Point connection in GHS. "The GHS will have to get the subsidy form signed by individual members and counter-signed by the president or secretary of the society and submit it to the discom. Besides, it is mandatory for the GHS to maintain consumption data of individual members," said a DERC official. Once a discom receives the subsidy claim form, it will then adjust the subsidy amount in the subsequent bill of the household." Few Group Housing Societies of Dwarka haven't apply, avail and pass on the subsidy benefit to its residents; as most feel that it's an cumbersome procedure. However, it's not the case as several societies are already availing this benefit. Reduction in monthly electricity bills of the residents is a Win Win Situation for GHS nd it's residents. - This order of DERC also specifices that GHS shall bill the individual members of society as per applicable Electricity Tariff slab for Domestic Consumers; which also isn't being followed up by GHS. The common area light cost to be charged at Rs. 4.5 / kWh which is the slab for GHS Societies having 11 kV connection. This is an important point and needs to be analysed to check it's implications. DERC (Supply Code and Performance Standards) Regulations, 2017. Refer Pg 30 to Pg 34 of attached notification Conversion of single point connection to individual connection. Quite a lot of societies of Dwarka have already applied for conversion of Single Point to Multi Point consumption. In this case there would be individual meters and Society staff will get free from meter reading, data entry, bill printing etc. Individual flat will get bill from BSES and 50% subsidy can be availed easily. This could be a game changer in switching towards renewable energy. Pilot project in few societies of Dwarka is already going on. Moreover, to setup the solar plant, a 30 % capital subsidy is provided by the MNRE along with a Rs 2 per unit generation based incentive allotted to a limited number of early projects by the Delhi Government."